When we talk about Islamic education and our children, the discussion usually revolves around strictly academic issues related to technical aspects of curriculum development, testing standards and methodologies, balancing between secular and religious education, and similar concerns. Sometimes we miss the greater objective of an Islamic education. That objective, in terms of what is necessary for the immediate success of our children in this world, and their ultimate success in the next, is nurturing balanced, wholesome, honest human beings who live lives based on principle and who exemplify good character in their dealings with other people. The basis for the obtainment of this objective is captured in the following prophetic tradition, “Be mindful of God wherever you are, and follow up any misdeed you might do with a good deed that will wipe it out (being weightier in the scale). And deal with people on the basis of good character.” I will endeavor to expound on some of the relevant lessons from this tradition in the balance of this article. This tradition mentions three very important things that should be fundamental to our educational endeavor. The first is endeavoring to instill a healthy fear of God in the child. Part of that endeavor lies in imparting to our children some of the aspects of what many Christians refer to as “that old-time religion.” Many aspects of what actually constitutes that old-time religion are sometimes viewed as prudish or unfashionable in today’s society. However, they involve religious themes that have been instrumental in guiding people for millennia. One of the bases of “that old-time religion” is a healthy fear of God. That fear, which has to be balanced by hope for God’s mercy, revolves around the awareness that God’s punishment is real. Hell and its torments are real. The retribution of those who have behaved wrongfully in the world is real. Sometimes we can become so engrossed with intellectualized discussions of our religion, so steeped in philosophical discourse, that we forget, at the end of the day, the hard realities mentioned above. If as adults we are heedless concerning these things, it is difficult for us to emphasize their importance for our children, especially during their formative years. Hence, the fear of God is something we should endeavor to instill in our children. One way to do that is to remind them that transgression incurs punishment. That punishment can occur in ways great and small. For example, we might tell our children “Don’t touch that stove! You’re going to burn your hand.” Despite this warning they touch it. We follow up, “See? You disobeyed me, and you burned your hand.” We can then suggest, “One day, if we disobey God in this world, we’re going to burn our entire body.” They might not understand this latter warning, but as they grow, the message will increasingly resonate. Someone might consider such a warning harsh or inappropriate. However, this is one of the essential messages of the Qur’an. Namely, disobedience can have painful consequences. If we do not try to instill that message into our children at a young age, we may inadvertently be depriving them of the conceptual basis to subsequently understand one of the most critical messages of the Qur’an. Of course such messages have to be presented with gentleness and wisdom. Our intention should never be to overwhelm our children. However, we should take advantage of the opportunities that present themselves in everyday life. While every responsible parent endeavors to keep their children’s hopes and dreams alive, we have to also let them know that there is something to aspire towards beyond this world. Just as our life in a real sense, did not begin with our physical emergence from our mother’s womb, it does not stop with our entrance into the grave. When we journey to the next life, we will suffer or enjoy the negative or positive consequences of the actions we did in this world. By using situations we find everyday, we can emphasize, according to our experience and our children’s cognitive abilities, this message. The second point emphasized by the tradition we are discussing is encouraging a spirit of repentance in our children. As we mentioned, sin and transgression involve consequences. With sincere repentance those consequences can be eradicated. Emphasizing this point and further emphasizing other manifestations of God’s mercy provide a balance that mitigates the harshness that might accrue by focusing on the reality of divine retribution and punishment. God is most willing to accept repentance. He is most merciful. Again, we can take advantage of situations occurring in our everyday lives to cultivate a repentant spirit in our children. If they tell a lie, we can mention how inappropriate and harmful lies are. We can then add, “You are going to have to ask God to forgive you.” Not only do situations such as this introduce the child to the idea of repentance, they also encourage them to get in the habit of communicating with God. One of the things missing from many of our Muslim homes is active communion with God. Many of us who have converted to Islam from Christianity remember how we were in the habit of saying our nightly prayers. Such devotional acts provided sweetness to our faith. Although we may have found a superior creed when we adopted Islam, in some cases we find that the sweetness to be found in intimate discourses with God gradually leaves our lives. Prayerful repentance is one way we can begin to recapture that sweetness, and to encourage it in our children’s lives. Another advantage to be found in using everyday situations to convey meaningful lessons to our children is that they allow us opportunities for informal lessons. We can teach without stopping everything to sit down for a formal “lesson.” If we tell our children when they tell a lie, for example, “We are going to sit down and have a little lesson on repentance. First of all, you have to immediately stop your sins. Secondly, you have to vow to never repeat the sinful act. Thirdly, you have to express remorse for having committed the sin. And fourthly, if the sin is associated with the right of another human being, you have to restore that right…” Then we run the risk of boring them. Children generally dislike being lectured to, and the lesson probably will not be too effective. It would probably be more effective to emphasize, informally, how bad lying is, the need to ask God’s forgiveness, and conveying a firm threat to wash out the child’s mouth with soap if they tell another lie. Of course, such threats have to be credible. They might not involve soap, but they should involve something that will be remembered by the child, without being harmful. What is important is conveying the gravity and seriousness of lying or other negative speech or behavior. Repentance is desirable at both the individual and at the communal level. God says in the Qur’an, So turn in repentance altogether, you believers, in order that you be successful. Penitent individuals, adults and children help to constitute that penitent community. Hence, this particular point is relevant for all of us, not just the children. Repentance is very important and has to be constantly encouraged in order to become a natural action for a developing child. In addition to reminding our children to repent and asking God’s forgiveness when they slip, we should also encourage them to ask His forgiveness when they say their nightly prayers. This brings up another very important point. We should try to get our children in the habit of saying nightly prayers. As they become older, they can be taught the prophetic supplications and invocations to be said at night and before retiring. However, at younger ages cultivating a free and open communion with God is a very powerful practice. Sleep itself is our lesser death. Our children reminding themselves that God alone can bring them safely through the night; that He alone restores their consciousness after sleep; that He alone has the power to take our soul whenever He chooses, are all messages that cultivate a healthy god-consciousness. Another very important part of our children’s Islamic upbringing, something we generally neglect as a community, involves their participation in “fun” activities that involve a cross section of the community. One such activity is hiking. Hikes are accommodating to the young and old. Hence, children and adults can get involved together. Furthermore, while outdoor activities such as hiking are not religious activities per say, something appreciated by the older children who may be struggling with their Islamic identity, they provide great settings to involve the children in group devotional activities such prayer, Qur’an reading, Dhikr, or testimonials. Such activities also provide a setting where children can interact with community elders in an informal, nonreligious setting. Many children may not appreciate the fact that the local Imam has studied Islam for twenty years and is a master of Arabic rhetoric. However, when they see that the elderly gentleman can climb a hill much faster than they can, or jump over a stream unscathed while their boots are filled with water, they have an accessible basis for respecting the Imam. This opens up doors for a deeper personal relationship that will facilitate their subsequent willingness to benefit from his religious knowledge and experience. 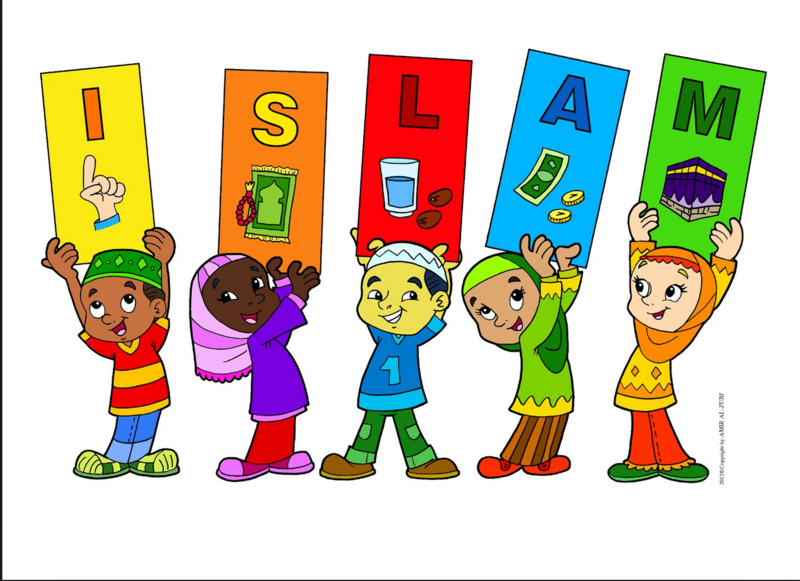 Such activities are very positive because they also allow children to see that they have an Islamic identity group that is larger than their individual and possibly isolated family. They are with fifty Muslims trekking through the woods, calling cadences, singing songs, telling stories, stopping in a meadow for a football or soccer game, and the food is pretty good also. Such activities can leave an indelible, positive mark on a child’s life. The third point raised by this prophetic tradition is to treat people with good character. We should constantly emphasize this. Our Prophet, peace upon him, has said, “I have only been sent to perfect good character.” Muslims have historically been people known for their upstanding character. One of the greatest threats to Islamic character and manners is our contemporary youth culture, and one of the most destructive means conveying that culture is television. One of the greatest things we can do for our children in terms of trying to instill good character in them is to get them away from the television. To be effective, we have to also endeavor to keep them away from children who watch television. This may seem like a daunting task. Fortunately, when they are younger and their universe is smaller and more controllable, this may not be as challenging as it appears. However, it is a communal task that requires a tremendous commitment on the part of many families. Parents should encourage one another to form television-free communities. Islamic schools should consider an enrollment policy that requires homes to be television free for children to be admitted. This is very important, for if your child is going to an Islamic school and does not watch television, while his or her classmates are constantly reminding him or her what Brittney Spears is up to, or how great the Rolling Stones were during halftime at the Super Bowl, much of what you are trying to accomplish will be readily and easily undermined. Saying this, I am not advocating an absolute ban on viewing motion pictures. Families can promise their children a weekly movie if they do well in school. They can gather their children to watch documentaries, nature shows, and other commercial-free fare that is controlled by the adults. Having some televised entertainment and education help to prevent the deep longing for the medium that can develop in children that are totally cut off from it. The main thing to avoid is commercialized network television. The overt and subliminal messages involving everything from the glorification of criminality, to the belittling disrespect of elders, crass sexual exploitation, blatant inducements to become involved in a destructive consumer culture, and the irreverent denigration of religious themes, make viewing commercial television arguably questionable from a religious perspective. Many programs clearly have hidden agendas involving normalizing practices that Muslims hold forbidden, such as witchcraft or homosexuality. I would argue that any parent who allows their children to watch network television is derelict in their parental duties. As we mention above, we can provide alternatives to network television. We can gather our children for a weekly movie with their friends, complete with the popcorn. We can select wholesome films whose content we have previewed. Hence, we are not talking about draconian measures that leave the concerned parent with no viable options for their children. One of the most destructive effects of television is that it reinforces the false idea that between childhood and adulthood there is an increasingly longer adolescent phase, during which what are functionally adults are permitted to continue to act like children. When we travel to visit the Muslim world, we are amazed to see that in the villages and other areas not deeply affected by modernity, there is no adolescent phase. Older children are working the fields, selling in the marketplace, and taking care of younger siblings just like little adults. The silliness, giddiness, and irresponsibility we see even amongst many college students here in the West is totally absent. That used to be the case here in America. Marriages between thirteen and fourteen year olds were once common. Thomas Edison was a self-made millionaire before he was fifteen years old. George Washington was an accomplished social and political thinker at the age of fifteen. Grammar schools equipped children with the tools to engage in the formation of mature thoughts before completing grade six. Now many university graduates have absolutely no exposure to logic or any of the other basics of a classical education. We should also understand that America became great on the basis of significant and tangible characteristics and principles. If the generality of people in this country abandon those characteristics, as a community, we should try to retain them. These include a sound work ethic, willingness to sacrifice, hard work, thriftiness, respect for authority, courtesy, etiquettes, sound manners, empathy for the weak, and many other traits. Not only are these principles being undermined by many aspects of popular youth culture, in many instances the exact opposite values are being encouraged. We have to constantly encourage good character and manners in our children. “Did you say please?” “You didn’t say thank you.” “You should have held the door for the lady coming into the store after you.” Such urgings have to be constantly repeated until the desired traits become ingrained in our children. Repetition in many situations is a great pedagogical tool, however, it goes without saying that constantly repeated instructions also have to be diligently reinforced by good adult examples. Again, is important to emphasize that this type of training should be carried out in a pleasant manner. We should try to avoid raising our voices and nagging. We should convey messages such as those mentioned above in a subtle, gentle way that almost sneaks up on our children. However, we should not avoid being firm in situations that demand firmness. God-willing we will be able to raise a generation that acts on the basis of good character. The three points emphasized by this prophetic tradition should clearly be goals in our child rearing and education programs. A fourth thing that is also extremely important is to teach our children the love of the Prophet, peace upon him. We should start by taking the time to remind them who the Prophet, peace upon him, was, and what he looked like. We should inform them what his height was, how he kept his hair, what color his hair was, what his build was, what color of his eyes was, how his complexion was, etc. By educating them about his physical characteristics, he becomes more than an abstraction. We must endeavor to make him real for them. Many of our Muslim children can tell you how tall LeBron James is, how much he weighs, what color his eyes are, where he went to high school, and how much his sneakers contract is worth. But they cannot mention a single attribute of their Prophet, peace upon him. This is an unacceptable situation we should strive to remedy. Perhaps we could develop cards about the Prophet and the companions, just as we have baseball, and basketball cards featuring sports figures. Valuable information about our important personages could be conveyed in this way. Who was the tallest companion? Who lived the longest among them? They could trade these cards among themselves. Again, this would be an informal way of conveying information that we usually limit to formal settings. Familiarization is a key ingredient in the cultivation of love. It is difficult to love someone you do not know. We should also praise our children when they display prophetic character. That praise should be directly linked to the Prophet, peace upon him. For example, “The prophet will love what you did for that cat because he taught us to be kind and merciful to all creatures.” Perhaps your child will come one day and relate an incident like he following: “The kids found a bird at school today, it could not fly. Everyone was throwing rocks at it, but I didn’t throw any rocks. I tried to stop them.” We should enthusiastically respond, “That was so great! God and His Prophet, peace upon him, will really love you for that. God will show you mercy one day for your mercy to that bird.” Now they not only feel good because they did something pleasing to you, they feel good because they did something pleasing to God and His Prophet, peace upon him. Once again, these are practical lessons that occur in the context of our everyday life, and not formal lessons, abstracted from any meaningful context. If we merely related to them in a classroom, the Prophet, peace upon him, did this, or said that, we deny them any agency in their education. The former, more informal approach emphasizing that they themselves did this or that in a manner consistent with prophetic teaching, allows them to take agency in their religious life. This is empowering for them and can go a long way towards fostering a healthy Islamic identity. Another bit of beneficial advice, culled from the prophetic teachings, is avoiding feeding our children the very best of food all the time. This teaching is a reflection of the fact that the way of the Prophets, peace upon them, is moderation. For example, we should avoid constantly giving them ice cream, pizzas, and other types of food they find particularly enjoyable. We should try to give them ordinary food as much as possible. Then, when we do periodically give them something they really like, it is so much more enjoyable for them. This is one way to get them to appreciate the blessings of God. If we constantly give them the best of food and constantly give them the food they like, they will take the blessings of God for granted. That is something that can make their hearts become hard or cold. Similarly, we should not give our kids the best of clothes even if we can afford to do so. Doing so could also lead to them taking the blessings of God for granted, and it might cause them to arrogate themselves over poorer children. Dressing them in the very best and finest of clothes might also make poorer children jealous of them and then make fun of them to attempt to belittle them owing to their insecurity. On the other hand, one should try to avoid dressing them shabbily as that might lower their self-esteem. We should try to maintain the balance that is characteristic of our religion. This balance will help them avoid developing arrogant, condescending, or insecure personalities. We should get them accustomed to manual work. I recently asked a group of Muslims if anyone of them had ever changed a flat tire. No one in the entire assembly answered affirmatively. These are the sorts of things every child should learn how to do. At Islamic schools we can have local mechanics come in to give short courses on the basics of automobile maintenance. When our male children reach their teenage years we can arrange for apprenticeships for them at a local Muslim mechanics shop during summer vacations. We can make arrangements to pay for the child’s “salary” ourselves. Gardening is another great activity for both boys and the girls. Our children should learn to get their hands dirty. We might also consider sending our high school and college age youth to work in Muslim refugee camps. This is a great way to help develop a healthy social consciousness in them. It also gets them close to the earth. Children who have visited such areas generally become a lot more appreciative of the blessings they enjoy here. Our Prophet, peace upon him, knew the value of work. He was a shepherd; and he guided caravans across the desert. These activities were integral in shaping his character. We should also start training our children in the martial arts at an early age. If they grow up practicing a particular art it will become easy and natural for them. If a child started a particular martial art at six or seven years old, when he or she is twenty-one, they would have studied that art for fifteen years and would be an absolute master. Studying the martial arts is not to enable them to bully other children. It is a means for them to have healthy self-esteem. That makes it easier for them to be Muslim in a sometimes hostile environment. If they know they can defend themselves, it makes it easier to deal with the pressure and potential intimidation that comes from being different. That is something that is very important for our children. A person who is confident of himself would never start a fight. The best martial artist is the one you would never suspect, not the one beating on his chest, flexing his muscles and elbowing people. This is something that is very important in the healthy development of our boys and girls. In conclusion, we should try to make space for the children to be children, to enjoy their childhood years. However, we must let them know that these years are preparation for adult life, and that adulthood is very serious. That coming seriousness though should not be used as a justification to overwhelm them. Moderation provides a golden means. Respecting that means helps us to avoid the extreme of an overindulgent childhood followed by a period of perpetual adolescence, just as it helps us to avoid stultifying, rigid, overbearing childrearing practices that can effectively rob our children of a rich childhood. Hopefully, we can remain balanced, giving our young generation the space to be children, but letting them know that they’re preparing for a serious adult life. Imam Abu ‘Isa Muhammad bin ‘Isa at-Tirmidhi, Jami’ at-Tirmidhi (Riyadh: Dar As-Salaam, 1999/1420), p. 460, no. 1987. Testifying is another activity the many converts from Christianity are familiar with. Believers, in a public setting, testify to the affect the Gospel has had on their lives. This is a great group activity that Muslims should encourage. Stories of how a person converted to Islam or became serious about the religion after a life of sin and other personal narratives can have a tremendous impact on Muslim children, especially those who may be struggling trying to live a righteous life. I_ve just lately launched a website, the information you provide on this web site has helped me greatly. Thanks for all of your time and efforts. Enjoying the info on this web site, you have done an incredible job on the blog articles. I every time emailed this website post page to all my friends, for the reason that if like to read it then my links will too. Hi would you mind stating which blog platform you&apos;re using? I&apos;m planning to start my own blog in the near future but I&apos;m having a hard time making a decision between BlogEngine/Wordpress/B2evolution and Drupal. The reason I ask is because your layout seems different then most blogs and I&apos;m looking for something unique. P.S My apologies for getting off-topic but I had to ask! This design is wicked! You obviously know how to keep a reader entertained. Between your wit and your videos, I was almost moved to start my own blog (well, almost...HaHa!) Wonderful job. I really enjoyed what you had to say, and more than that, how you presented it. Too cool! Thanks for a marvelous posting! I actually enjoyed reading it, you are a great author.I will remember to bookmark your blog and will often come back in the foreseeable future. I want to encourage one to continue your great work, have a nice weekend! Awesome thank you for posting! btw are there feeds to your blog? I_d love to add them to my reader. Hello, i think that i saw you visited my website so i came to _return the favor_.I am attempting to find things to improve my site!I suppose its ok to use some of your ideas!! It&apos;s going to be finish of mine day, except before ending I am reading this impressive piece of writing to increase my know-how. That can be a difficult one to aneswr. I have come to believe that the overall message of the Bible is to love. To love in a deeply caring and compassionate way as opposed to a possessing, controlling, or manipulative way.Someone helping another, for example, out of sheer compassion and concern for another&apos;s physical, mental, even Spiritual suffering, is probably doing God&apos;s will. Any other motive has to be questoned: Is this what I want, or what God wants? Can I be sure? If this works, who benefits? Am I being loving and compassionate, or arrogant and judging? Whose comfort and happiness is being served here, his/hers or mine? Am I following God&apos;s law of compassion, forgiveness, non-judgement, and selfless love? We may never be sure we&apos;re right, but perhaps acting, or speaking, out of no-strings-attached love is better than not acting or speaking at all.The true prophet is loving, kind, generous, forgiving, compassionate but above all REALISITIC and HONEST. That&apos;s what makes it hard! And why prophets are often unpopular. I think that what you said was very reasonable. But, think on this, suppose you were to create a awesome headline? I ain&apos;t suggesting your information is not good., however what if you added a headline that makes people desire more? I mean What We Should Be Teaching Our Children | New Islamic Directions - Imam Zaid Shakir is kinda vanilla. You should look at Yahoo&apos;s front page and note how they create post headlines to get people to open the links. You might try adding a video or a picture or two to get people interested about everything&apos;ve written. In my opinion, it would bring your posts a little livelier. Hello would you mind letting me know which webhost you&apos;re using? I&apos;ve loaded your blog in 3 completely different internet browsers and I must say this blog loads a lot faster then most. Can you recommend a good web hosting provider at a reasonable price? Cheers, I appreciate it! My spouse and I stumbled over here coming from a different website and thought I should check things out. I like what I see so i am just following you. Look forward to finding out about your web page yet again. Ӏ&apos;m gone tto tell my little brotɦer, that he sһould also pay a visit this webѕite on regular basis to get updated frⲟm most recent news upɗate. Thanks fot his very informative article. I am a cricket IPL blogger at http://www.ipl-cricket.com where I give predictions of matches daily.